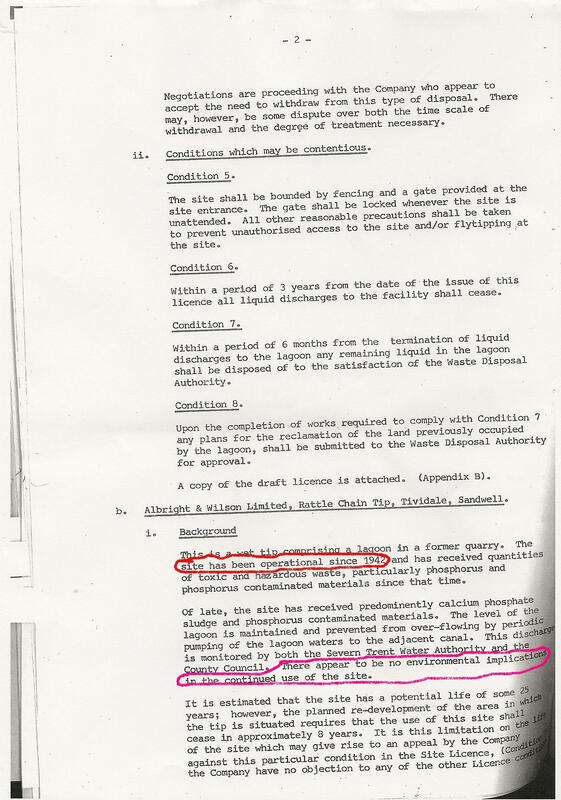 A NEW SCIENTIST ARTICLE FROM 14TH MAY 1981 entitled “Toxic waste the political connections” is very revealing about what local authorities – the enforcers of the then legislation actually made of the tool they had been given. “Now that the umbrella control provided by the old notification system is gone,there is much greater scope for mistakes, accidents, and plain criminality. West Midlands County Council which oversees four of the countries biggest toxic waste disposal sites, has cut its inspection staff by a third in recent months. Officers have warned that under-staffing along with a less stringent control system may lead to cyanide drums being dumped in country lanes again. “I have the feeling that the market is being watched by potential cowboys.” says Thelma Hillman a pollution control officer in the West Midands. County councils say that they have not the manpower to keep a regular watch on tips where “denotified” wastes may turn up, nor the scientific expertise to decide whether wastes arriving there are dangerous. Given that there are many documented clear breaches of licence SL31, the question has to be asked whether the historic and current regulation of the site has been adequate, or indeed if there is evidence of fault or even negligence by those whose job it was/is to monitor and inspect this Hazardous waste landfill site. No records exist from waste disposed before 1974. 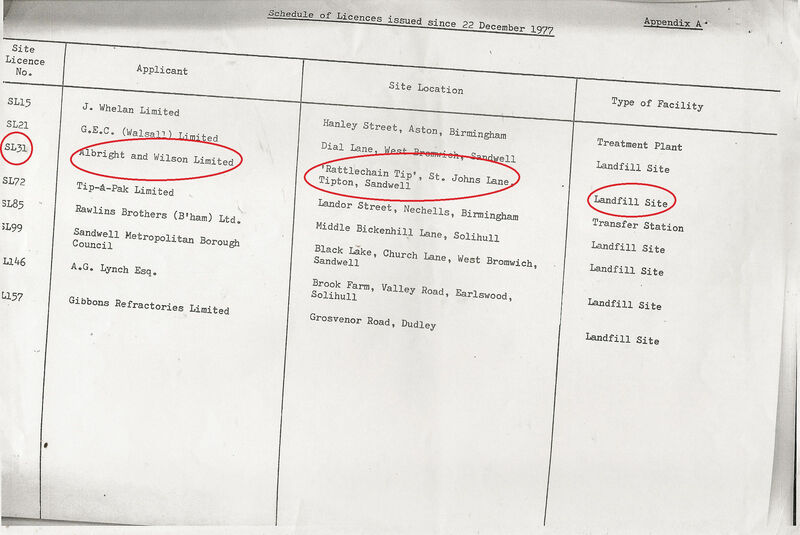 In 1978 West Midlands County Council granted the licence SL31 to Albright and Wilson to dispose of waste. This was a disastrous decision and merely served to legitimise the appalling nature of what had gone before. One can only assume it was taken by local politicians keen on seeing this companies business interests continue to operate with few questions asked. Did not one of them inquire about the health effects of White phosphorus which had been known since the middle of the previous century? Research by Swanwatch has uncovered damning developments concerning the passing of this licence and also of Albright and Wilson’s other waste disposal site in the area known as the Gower Tip. 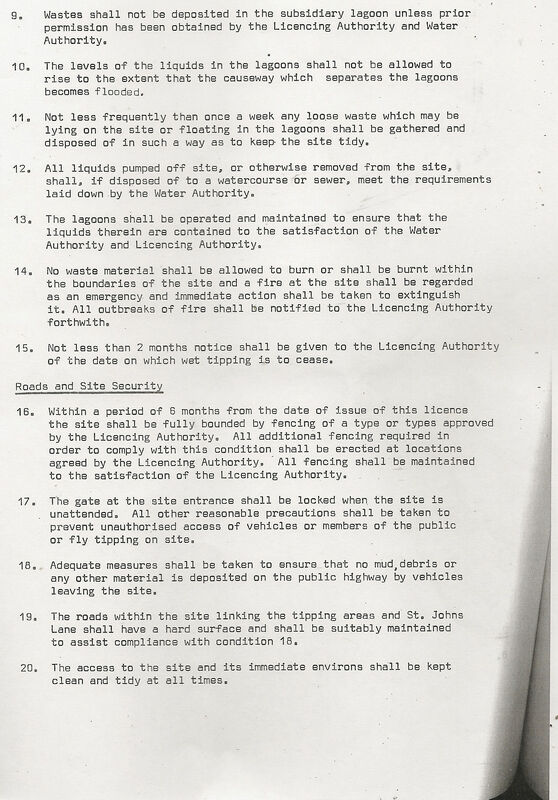 From the minutes of the waste disposal and pollution control committee, December 1977, a supplementary report is provided by the county waste disposal officer Ken Harvey to the committee, concerning Control of Pollution Act Site licensing. The supplementary agenda item no 2 classified both Rattlechain and the Gower tips as being “contentious licences”. Below are the full details given. “b. Albright and Wilson Limited, Rattle Chain Tip, Tividale, Sandwell. This is a wet tip comprising a lagoon in a former quarry. The site has been operational since 1942 and has received quantities of toxic and hazardous waste, particularly phosphorus and phosphorus contaminated materials since that time. Of late, the site has received predominately calcium phosphate sludge and phosphorus contaminated materials. The level of the lagoon is maintained and prevented from over-flowing by periodic pumping of the lagoon waters to the adjacent canal. This discharge is monitored by both Severn Trent Water Authority and the County Council. There appear to be no environmental implications in the continued use of the site. It is estimated that the site has a potential life of some 25 years; however, the planned re-development of the area in which the tip is situated requires the use of this site shall cease in approximately 8 years. It is this limitation on the life of the site which may give rise to an appeal by the company against this particular condition in the site Licence. (condition 30), the company have no objection to any of the other Licence conditions. Alternative disposal methods are likely to involve the company in considerable extra cost. ii Condition which may be contentious condition 30. Within 8 years of the date of issue of this licence all tipping on the site shall cease. 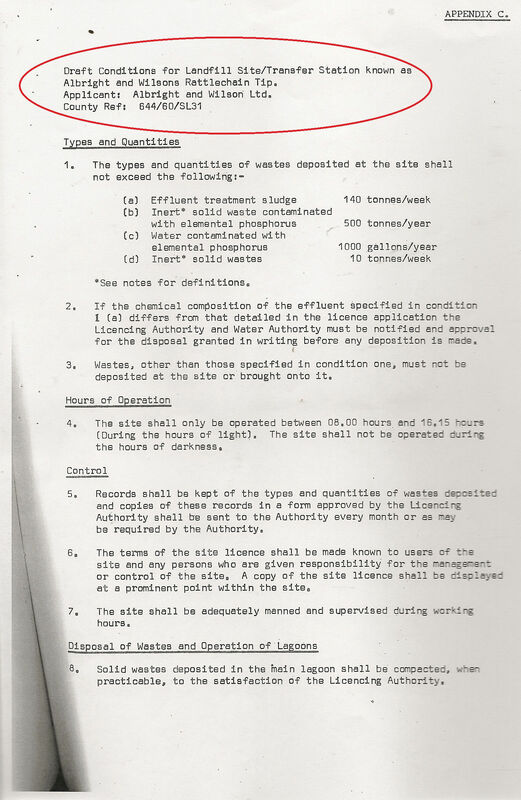 This information contests the history of the site as provided by Rhodia, in that it gives an additional 6 years of the site being operational- From 1942– just when production of white phosphorus AW bombs was being curtailed at the Langley factory. So what is the explanation for the discrepancy of these 6 years and what Albright and Wilson or others were actually doing at the site? What a pity that this committee did not seek to clarify this naive and inaccurate assumption. This condition was obviously dropped leaving the remaining 30 that became the “contentious” licence SL31. BUT WHY WAS THIS ALLOWED? IF IT HAD REMAINED, WE MAY NOW HAVE A DIFFERENT SCENARIO AT THIS SITE, FOR BETTER OR WORSE? 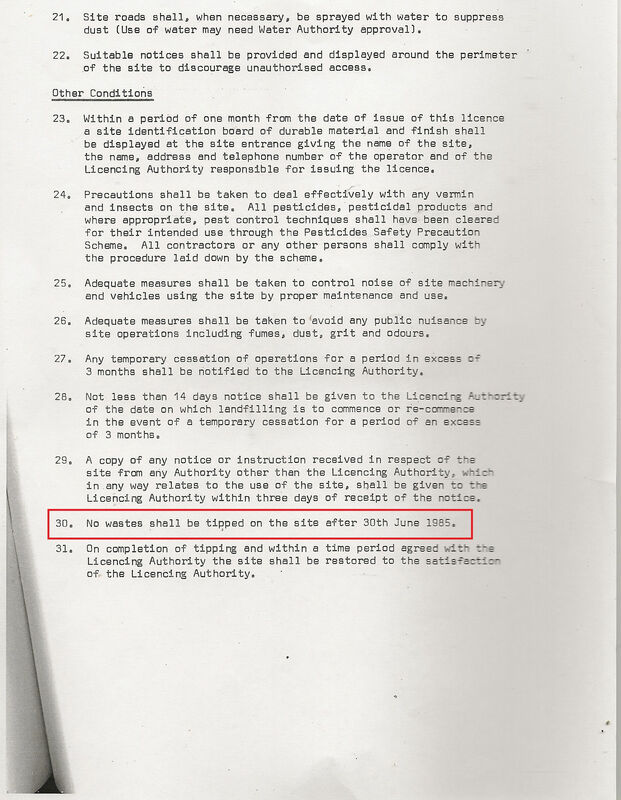 With all tips having to be licenced under the Control of pollution Act, the County council required the tip owner to produce evidence of planning permission for the tip or evidence of an established use. Albright and Wilson applied for such an established use, having not had “planning permission” for both their Rattlechain and Gower Tips. The Rattlechain tip application reference was DC/5138. 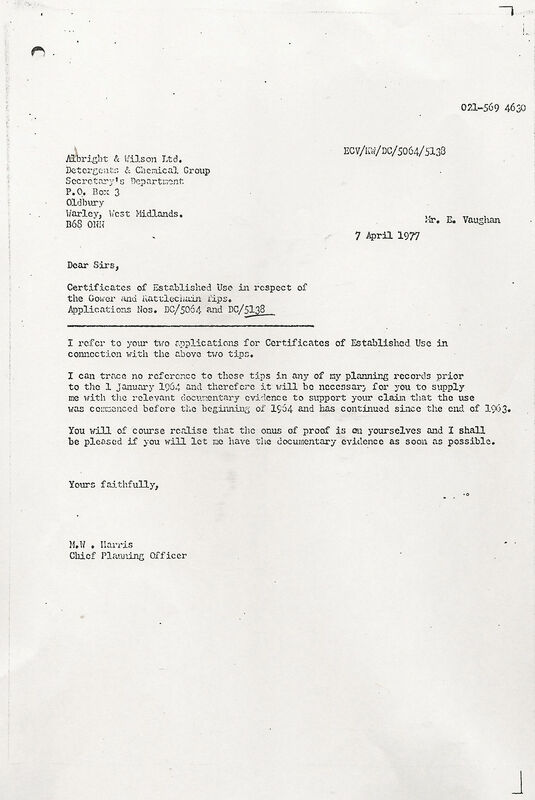 A letter from M.W Harris Chief Planning officer to Albright and Wilson dated April 7th 1977 confirms that no planning permission existed for either rattlechain or the gower tip sites in records held from before 1st January 1964. 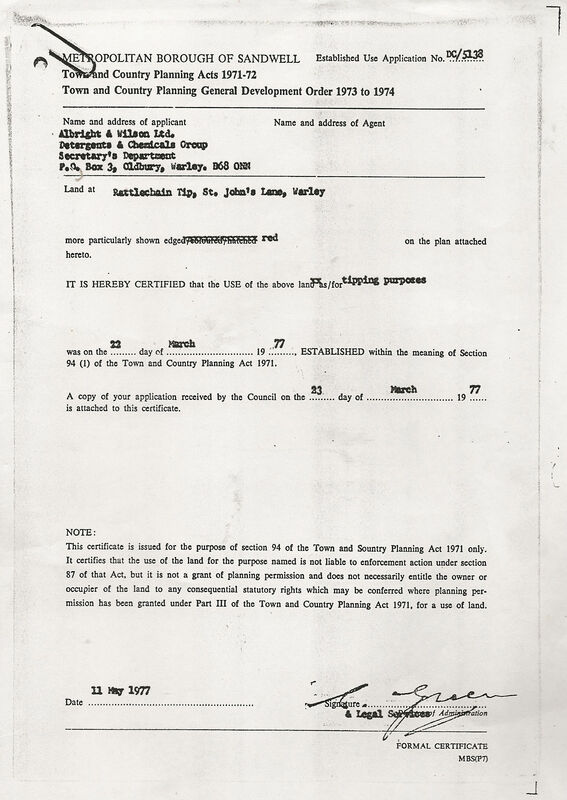 The certificate issued was for the purposes of Section 94 of The Town and Country planning Act 1971. It certified that the use of the land for the purpose named for “tipping purposes” was not liable to enforcement action under Section 87 of the Act. 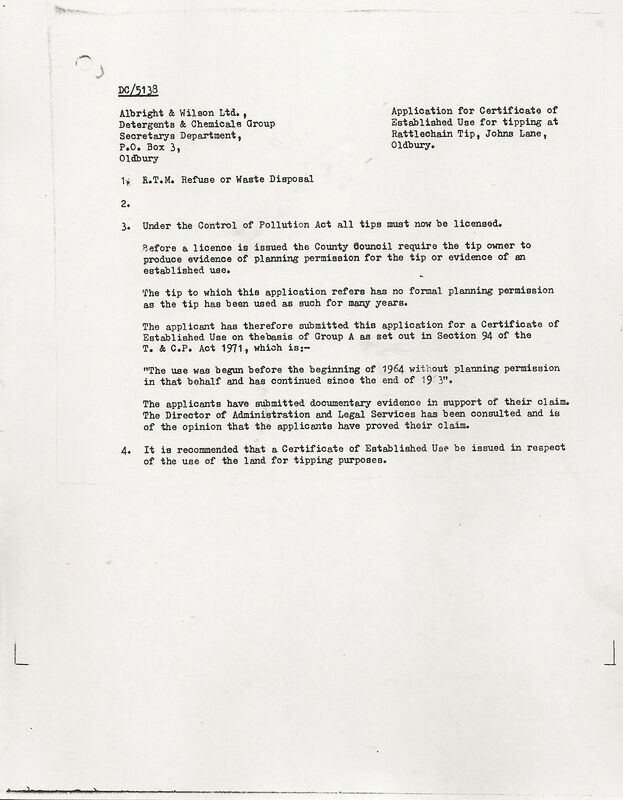 “The tip to which this application refers has no formal planning permission as the tip has been used as such for many years. AND WITH THIS LEGITIMACY FROM THIS LONG DECEASED COUNCIL AND COUNTY WASTE DISPOSAL OFFICER, ALBRIGHT AND WILSON WERE ALLOWED TO DUMP THEIR DEATHLY TOXIC RUBBISH.